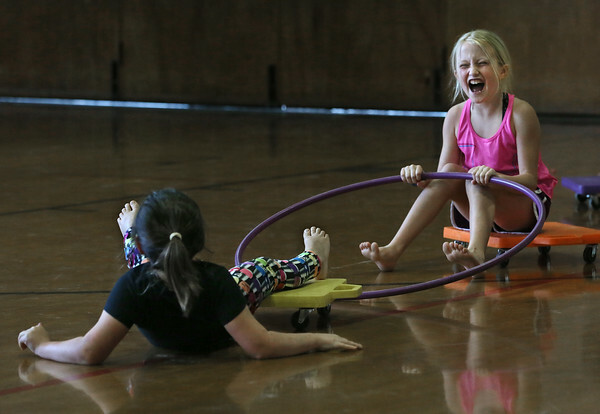 Fourth-grader Torrin Kirk, right, laughs as her classmate Naia Zachareas takes a spill while playing a friendly game of tug-of-war using a Hula Hoop Tuesday during an after-school "Interactive Day" party at Memorial Elementary School in Manchester. The party was organized by the Manchester Parks and Recreation Department to coincide with an early release day at the school. In addition to Twister, the event included musical entertainment by an MC, an inflatable Bounce House, snow cones and prizes.